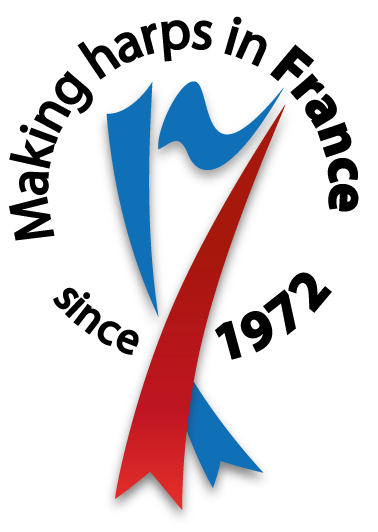 Vienna, classical music hub ever since the late eighteenth century, continues to be a city of music without compare. The unique Vienna State Opera and Vienna Philharmonic Orchestra have been part of this tradition for the last 175 years. We’re very proud that the orchestra recently selected one of our Art Noveau Gold instruments to join them in their work. 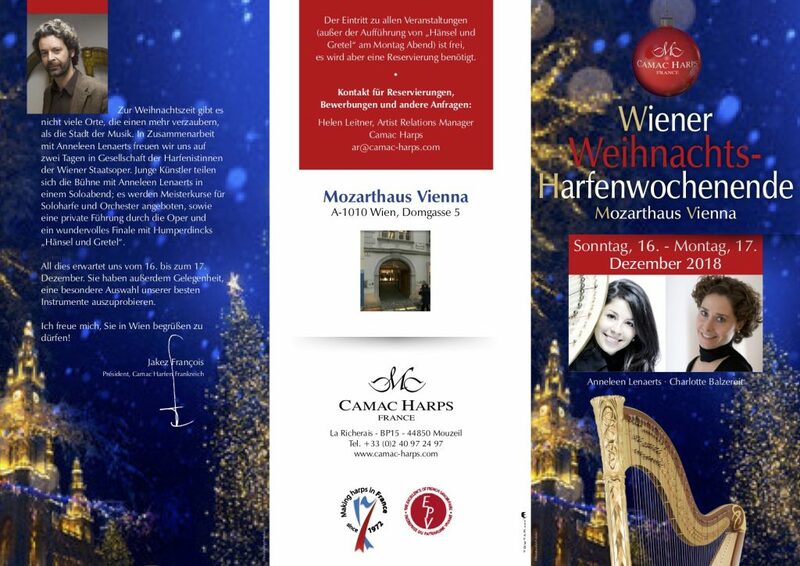 On Sunday, December 16th and Monday, December 17th 2018, we are delighted to be co-organising, with Vienna Philharmonic co-principal harpist Anneleen Lenaerts, two Christmas harp days in Vienna. These are designed to be an open window on the Viennese Classical world, a special event to which we are particularly looking forward. First of all, students have the chance to sign up to play for Anneleen in a masterclass, which will take place on Sunday from 10AM. The idea is that active masterclass participants also share the stage with Anneleen Lenaerts in the evening concert, also at the Mozarthaus Vienna. You can, of course, play a different piece in the concert to the one in the masterclass. To apply, please send a short video (one taken on a mobile phone is fine) of you playing your concert piece, to Helen at [email protected]. After the masterclass, Camac President, Jakez François, will give a conference on how Camac harps are made (4PM). Find out about the long French tradition of fine instrument-making, the innovations Camac has introduced to the traditional harp build over the years, and discuss with Jakez in person. At 7PM, the young artists from the morning’s masterclass will perform, followed by Anneleen Lenaerts with solo harp repertoire on operatic and symphonic themes. On Monday, December 17th, Charlotte Balzereit will give a class on orchestral audition excerpts. This is designed both for advanced students embarking on the audition circuit, and younger ones who are beginning to learn the repertoire. You need to have some excerpts prepared to performance standard, but it is up to you which ones, in order to make this class accessible to as many people as possible. You will also be able to ask Charlotte questions about the audition process. To register for this, please also send Helen an email with the excerpts you are going to bring. In the afternoon, we are lucky to be able to offer course participants a private tour of the Vienna State Opera – before the perfect Christmas finale: Humperdinck’s Hänsel und Gretel. Camac Harps have a limited number of tickets available to participants at a special price of 20€. Apart from the opera tickets, entry to all events is free of charge, with reservation required. At the Mozarthaus, we will also have a special selection of some of our best instruments, available for you to try throughout the event. You can download the web-definition flyer as PDF here (PDF, 749 KB). 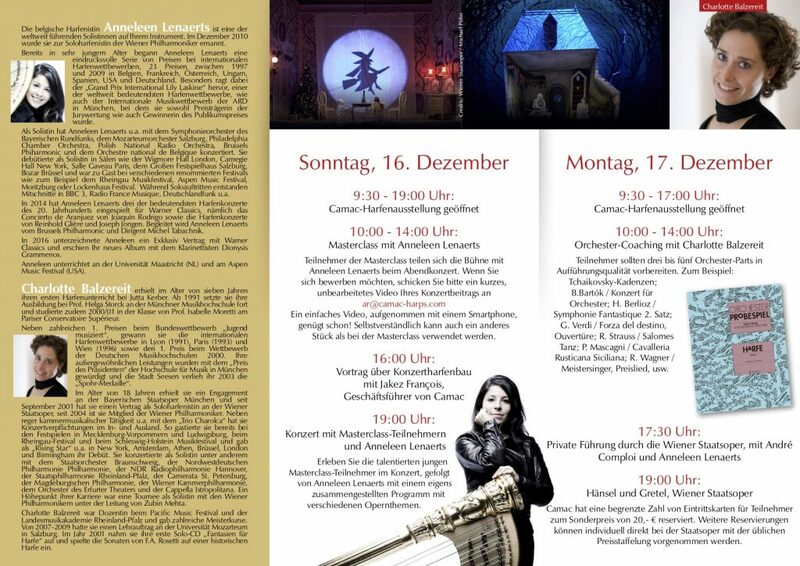 I would like to reserve an entry card for the concert on December 16th 2018 at 19 h at the Mozarthause in Vienna.